Worried about preterm labor? You can breathe a little easier. Study finds premature babies can survive outside the womb at 22 weeks—2 weeks earlier than thought. If you're pregnant, you're probably counting down to Viability Day, the moment when a preemie could potentially survive outside your body. This marker, generally agreed upon by medical professionals to be 24 weeks, lets pregnant women, especially those at risk for preterm labor, breathe a huge sigh of relief. A new study published this week in The New England Journal of Medicine has more good news: It suggests that V-Day could be pushed back from 24 weeks to 22. The study of 4,987 infants born between 22 and 27 weeks showed that some premature babies are surviving earlier than doctors had believed they could. Although the majority of babies born at 22 weeks did not survive or survived with major health issues, a small minority who received cutting-edge medical treatment grew into healthy toddlers with no issues. The study is causing doctors to rethink the date of viability, which is when hospitals will intervene to attempt to save a baby's life. One factor in whether or not the youngest preemies survived was whether they were treated in the first place. The study revealed that the standard of care varied greatly among hospitals for those babies born before 24 weeks, with only 22 percent of babies born between 22 and 23 weeks being treated. But, nearly a quarter of those treated (23 percent) survived, and 15 percent of them had no lasting serious problems. Why aren't more babies treated? It may have to do with hospital policies, plus the wishes of the individual parents and their physicians. "We found that variation in treatment was related to hospital outcomes, although we were unable to study specific reasons for the variation in treatment in our study," co-authors Matthew Rysavy, a medical student at the University of Iowa, and pediatrics professor Dr. Edward Bell told FitPregnancy.com via email. Dr. Edward McCabe, March of Dimes's chief medical officer, who was not involved in the research, agrees that the study proves a lot depends on the hospital where the preemie is born. 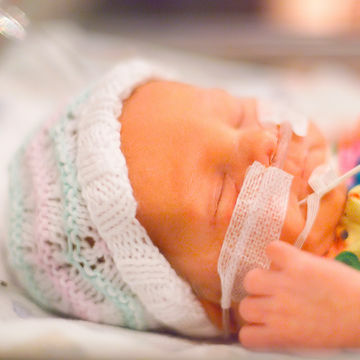 "Variations in hospital rates of active treatment for babies born at 22 weeks gestation were highly attributable to the birth hospital, and these variations appeared to influence the rates of survival," he says of the findings. If more hospitals treated the earliest preemies, it's likely that the survival rate would increase, but other considerations are at play as well. "Individuals may age and mature differently, and viability may vary slightly between babies," Rysavy and Dr. Bell say. "Also, gestational age dating is not perfectly precise. Other important factors include whether the infant is a boy or a girl [girls mature faster], the infant's birth weight, and whether the mother received antenatal corticosteroids [which mature babies' lungs]." Pregnant women concerned about preterm labor should check with their OBGYN about the policies at the hospital they'll be delivering at to see at what point they'll intervene to try to save a preemie's life. "Pregnant women may want to know about a hospital's outcomes for extremely preterm infants and how decisions are made about whether to provide intensive care to these babies," Rysavy and Dr. Bell advise. Hospitals with a higher level NICU are more likely to treat tiny babies, so high-risk women should consider switching to a more equipped facility. A state-of-the-art NICU is also more likely to employ the latest techniques and treatments after preemies are born. "Women giving birth to an extremely preterm baby should be delivered at a perinatal center that is able to provide high-level obstetric and neonatal care, if at all possible," Rysavy and Dr. Bell say. The prognosis for the youngest babies is still not very good, so it's important for parents to have all the information before deciding what lifesaving measures to take. McCabe recommends "decision-making on an individual basis with parental preference being important. The family needs to be involved. When possible, doctors need to be sure that parents are consulted and are provided with current, accurate information on potential outcomes, so that they can make informed decisions." According to the CDC, 1 in 9 babies is born prematurely. Although in about half of the cases of preterm labor the cause is unknown, there are some factors that may put you at risk, including advanced maternal age, carrying multiples, having a prior preterm birth, and health issues like high blood pressure or diabetes. To reduce your risk, don't drink or smoke while pregnant, avoid certain chemicals, take your prenatal vitamins, and make sure you're getting the proper prenatal care, because early intervention can keep your baby cooking longer and improve the outcome of a preterm birth.